How do you feel about your kids being around all of the toxic cleaners that are so common today? If you’re like us, we do NOT like it! Our family’s health is paramount. Shaklee’s Basic H2 is the evolution of one of Shaklee’s original products (Basic H), and a product with an incredible amount of uses. 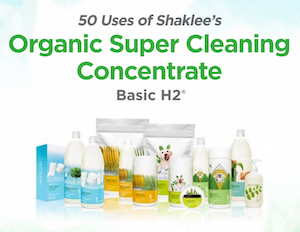 We’ve put together the ultimate guide to using Shaklee’s Basic H2 green cleaning product for you to download. Unlock the secrets of this amazing, toxin-free cleaning solution.